All pages Copyright © 2013 A2Z Computing Services. These Community Websites are part of a network of over 1,700 represented within the Hometown Canada Network of Communities. We rely upon and encourage all members of the community to participate in the development of these pages. So come on in and visit with us, see what our great communities have to offer and if you can't find what you are looking for, let us know by posting a question in our Community Forums so that a member of that hometown can reply to you or email you the answer. Alberta is one of Canada's provinces. It celebrated 100 years as a province in 2005 on September 1st. As part of the Centennial celebration, Queen Elizabeth II and Prince Philip visited the province from May 23 to May 25, 2005. Alberta's capital is the city of Edmonton. Its most populous city and metropolitan area, Calgary, is Alberta's economic hub and is located in the southern region of the province. Other major cities and towns include Banff, Camrose, Wetaskiwin, Fort McMurray, Grande Prairie, Jasper, Lethbridge, Lloydminster, Medicine Hat, and Red Deer. Alberta is named after Princess Louise Caroline Alberta (1848-1939), the fourth daughter of Queen Victoria. Princess Louise was also the wife of Sir John Campbell, who was the Governor General of Canada from 1878-1883. Lake Louise was also named in honour of Princess Louise. 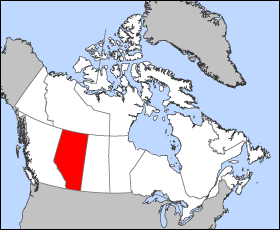 Alberta is in western Canada, with an area of 661,190 km² (260,000 mi²). It is bounded to the south by the United States boundary line, 49° north. Eastwards at 110° west it borders the province of Saskatchewan. At 60° north it is separated from the Northwest Territories. To the west, its border with British Columbia follows the line of peaks of the Rocky Mountains range along the Continental Divide, which runs northwesterly, until it reaches 120° west, at which point the border follows this meridian to 60° north. With the exception of the southern section, the province may be said to be well watered. Alberta contains dozens of rivers and lakes ideal for swimming, water skiing, fishing and a full range of other water sports. There are a multitude of fresh-water lakes each less than 260 km² situated in Alberta, and three of more considerable size. These are Lake Athabasca, 7898 km², part of which is in the province of Saskatchewan, Lake Claire, 1436 km², and Lesser Slave Lake, 1168 km². As Alberta extends for 1200 km from north to south, and about 600 km wide at its greatest east-west extent, it is natural that the climate should vary considerably between parallels of 49° and 60° north and also between 110° and 120° west. It is also further influenced by the different altitudes above sea level of the different parts of the province. Northern Alberta has fewer frost-free days than southern Alberta, which is almost desert-like in its summer heat and lack of rain. Western Alberta is protected by the mountains, and enjoys the warmth brought by winter chinook winds, while eastern Alberta is flat, dry prairie, where temperatures can range from very cold (-35°C (-31°F) in the winter) to very hot (+35°C (+95°F) in the summer). Central and southern Alberta are the most likely places in Canada to experience tornadoes because of the summer heat, and violent summer thunderstorms are common in the eastern half of the province. Alberta's capital city, Edmonton, is located almost exactly in the centre of the province, and most of Alberta's oil is refined here. Southern Alberta, where Calgary is located, is known for its ranching, and cattle run free through the whole winter. Much of the unforested part of Alberta is given over either to grain or to dairy farming, with ranching predominantly a southern Alberta industry. In southeastern Alberta, where the Red Deer River traverses the flat prairie and farmland, are the Alberta badlands with deep gorges and striking landforms. Dinosaur Provincial Park, near Drumheller, Alberta, showcases the badlands terrain, desert flora, and remnants from Alberta's past when dinosaurs roamed the then lush landscape. Overall, Alberta has cool winters, with a daytime average of about -10°C (14°F) in the south to -24°C (-12°F) in the north. In the summer the temperature averages about 13°C (55°F) in the Rocky Mountains and 18°C (64°F) in the dry prairie to the south-east. Sources: All 2005 figures are based on official 2005 census data from municipalities. Where no 2005 data is available, (*) indicates the most recent official data from either the municipality or the 2001 Statistics Canada federal census. All data for 2001 and 1996 is from the respective federal census. CMA data is from the most recent Statistics Canada estimate. Alberta is the largest producer of conventional crude oil, synthetic crude, natural gas and gas products in the country. Two of the largest producers of petrochemicals in North America are located in central and north central Alberta. In both Red Deer and Edmonton, world class polyethylene and vinyl manufacturers produce products shipped all over the world, and Edmonton's oil refineries provide the raw materials for a large petrochemical industry to the east of Edmonton. The Athabasca Oil Sands (previously known as the Athabasca Tar Sands) have estimated oil reserves in excess of that of the rest of the world, estimated to be 1.6 trillion barrels (254 km³). With the advancement of extraction methods, bitumen and economical synthetic crude are produced at costs nearing that of conventional crude. This technology is Alberta grown and developed. Many companies employ both conventional strip mining and non-conventional methods to extract the bitumen from the Athabasca deposit. With current technology, only 315 billion barrels (50 km³) are recoverable. Fort McMurray, one of Canada's youngest and liveliest cities, has grown up entirely because of the large multinational corporations which have taken on the task of oil production. Another factor determining the viability of oil extraction from the Tar Sands is the price of oil. In 2005, record oil prices have made it more than profitable to extract this oil, which in the past would give little profit or even a loss. While Edmonton is considered the pipeline junction, manufacturing, chemical processing, research and refining centre of the province, Calgary is known for its senior and junior oil company head offices (unlike Edmonton, Calgary is not close to any large sources of oil). With concerted effort and support from the provincial government, several high-tech industries have found their birth in Alberta, notably the invention and perfection of liquid crystal display systems. With a growing economy, Alberta has several financial institutions dealing with several civil and private funds. Agriculture has a significant position in the province's economy. Over 5 million cattle are residents of the province at one time or another, and Alberta beef has a healthy worldwide market. Nearly one half of all Canadian beef is produced in Alberta. Alberta is one of the prime producers of plains buffalo (bison) for the consumer market. Sheep for wool and mutton are also raised. 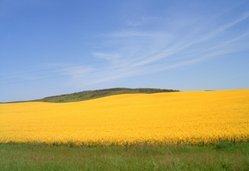 Wheat and canola are primary farm crops, with Alberta leading the provinces in spring wheat production, with other grains also prominent. Much of the farming is dryland farming, often with fallow seasons interspersed with cultivation. Continuous cropping (in which there is no fallow season) is gradually becoming a more common mode of production because of increased profits and a reduction of soil erosion. 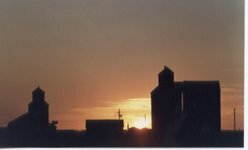 Across the province, the once common grain elevator is slowly being lost as rail lines are decreased and farmers now truck the grain to central points. Alberta is the leading beekeeping province of Canada, with some beekeepers wintering hives indoors in specially designed barns in southern Alberta, then migrating north during the summer into the Peace River valley where the season is short but the working days are long for honeybees to produce honey from clover and fireweed. Hybrid canola also requires bee pollination, and some beekeepers service this need. The vast northern forest reserves of softwood allow Alberta to produce large quantities of lumber and plywood, and several northern Alberta plants supply North America and the Pacific Rim nations with bleached wood pulp and newsprint. The government of Alberta is a parliamentary democracy. The unicameral provincial parliament -- the Legislative Assembly -- consists of 83 members. The government is headed by the Premier, Ralph Klein, and the city of Edmonton is Alberta's government seat. The province's revenue comes mainly from the taxation of oil, natural gas, beef, softwood lumber, and wheat, but also includes grants from the federal government primarily for infrastructure projects. Albertans are the lowest-taxed people in Canada, and Alberta is the only province in Canada without a provincial sales tax (though residents are still subject to the federal sales tax, the GST). Alberta's municipalities have their own governments which (usually) work in co-operation with the provincial government. Alberta's politics are much more conservative than those of other Canadian provinces. Alberta has traditionally had three political parties, the Progressive Conservatives ("Conservatives" or "Tories"), the centrist Liberals, and the social democratic New Democrats. A fourth party, the strongly conservative Social Credit Party, was a power in Alberta for many decades, but fell from the political map after the Progressive Conservatives came to power in the early 1970s. Since that time, no other political party has governed Alberta. In the 2004 provincial election, held in November, the Alberta Alliance Party, running to the right of the Conservatives, won one seat in that election. As with any Canadian province, the Alberta government is the highest authority in education, creating and regulating the school boards, public colleges, universities, and other education isntitutions. The vast majority of Alberta's schools are run by publicly funded school boards (each with its own district of authority). The largest are English language Public school boards. Alberta also has English Separate Catholic boards throughout the province, which serve a substantial minority of students. There is one protestant school board in part of the province. Where numbers warrant, there are francophone school boards (Public and Separate Catholic). All five of these types of boards are fully publicly funded (without tuition) by local property taxes and provincial grants given on an equal per student basis by the province (with some adjustments). The different types of school boards are a necessity under the Canadian constitution, which guarantees the francophones and Catholic communities both the right to their own schools, and the right to administer them. Some other Canadian provinces have reformed their school systems on non-religious lines, by seeking a constitutional amendment, but Alberta has not. Often the decision to go to one system or another is not based on religion, but a parent's belief of which system provides a better education. Starting in 1994, the province has allowed some chartered schools to operate, independently of any district school board, reporting directly to the province. Homeschooling is officially recognized and partially funded from within the Alberta school system. Originally in Alberta, school boards had the power to levy property taxes within their respective districts. However, this meant districts with a low tax base were underfunded, so the province moved to a system that pools the education property tax, and distributes it based on student population and need. The largest two universities in Alberta are the University of Calgary and Edmonton's University of Alberta. There is also Athabasca University, which focuses on distance learning, and the University of Lethbridge. There are 15 colleges that receive direct public funding, along with two technical institutes. Students may also receive government loans and grants while attending selected private institutions. Alberta has over 180,000 km of highways and roads, of which nearly 50,000 km are paved. The main north-south corridor is Highway 2, which begins south of Cardston at the Carway border crossing. Highway 4, which effectively extends U.S. Interstate Highway 15 into Alberta and is the busiest U.S. gateway to the province, begins at the Coutts border crossing and ends at Lethbridge. Highway 3 joins Lethbridge to Fort Macleod and links Highway 4 to Highway 2. Highway 2 travels northward through Fort Macleod, Calgary, Red Deer, and Edmonton before dividing into two highways. One continues northwest as Highway 43 into Grande Prairie and the Peace River country; the other (Highway 63) travels northeast to Fort McMurray, the location of the Athabasca Oil Sands. Highway 2 is supplimented by two more highways that run parallel to it: highway 22, west of highway 2, known as 'the cowboy trail', and highway 21, east of highway 2. Alberta has two main east-west corridors. The southern corridor, part of the Trans-Canada Highway system, enters the province near Medicine Hat, runs westward through Calgary, and leaves Alberta through Banff National Park. The northern corridor, also part of the Trans-Canada network but known alternatively as the Yellowhead Highway (Highway 16), runs west from Lloydminster in eastern Alberta, through Edmonton and Jasper National Park into British Columbia. On a sunny spring or fall day, one of the most scenic drives in the world is along the Icefields Parkway, which runs some 300 km between Jasper and Banff, with mountain ranges and glaciers on either side of its entire length. Urban stretches of Alberta's major highways and freeways are often called trails. For example, Highway 2 is Deerfoot Trail as it passes through Calgary, Calgary Trail as it leaves Edmonton southbound, and St. Albert Trail as it leaves Edmonton northbound toward the city of St. Albert. Visitors from outside Alberta often find this disconcerting, accustomed as they are to the notion that a trail is an unpaved route primarily for pedestrians. Edmonton, Calgary, Red Deer, Medicine Hat, and Lethbridge have substantial mass transit systems. Edmonton and Calgary also operate light rail vehicles. Alberta is well-connected by air, with international airports at both Edmonton and Calgary. Calgary's airport is the larger of the two, and is also the third busiest in Canada. It is a hub airport for a significant proportion of the connecting trans-border and international flights into and out of Alberta. There are over 9000 km of operating mainline railway, and many tourists see Alberta aboard Via Rail or Rocky Mountain Railtours. Alberta is well known for its warm and outgoing friendliness and frontier spirit. Summer brings many festivals to the province. Edmonton's Fringe Festival is the world's second largest after Edinburgh's. Alberta also hosts some of Canada's largest folk festivals, multicultural festivals, and heritage days (to name a few). Calgary is also home to Carifest, the second largest Caribbean festival in the nation (after Caribana in Toronto). These events highlight the province's cultural diversity and love of entertainment. Most of the major cities have several performing theatre companies who entertain in venues as diverse as the Arts Barns and the Francis Winspear Centre. Alberta also has a large ethnic population. Both the Chinese and East Indian communities are significant. According to Statistics Canada, Alberta is home to the second highest proportion (two percent) of Francophones in western Canada (after Manitoba). Many of Alberta's French-speaking residents live in the central and northwestern regions of the province. As reported in the 2001 census, the Chinese represented nearly four percent of Alberta's population and East Indians represented better than two percent. Both Edmonton and Calgary have Chinatowns and Calgary's is Canada's third largest. Aboriginal Albertans make up approximately three percent of the population. The major contributors to Alberta's ethnic diversity have been the European nations. Forty-four percent of Albertans are of British and Irish descent, and there are also large numbers of Germans, Ukrainians, and Scandinavians. Both cities heavily support first-class Canadian Football League and National Hockey League teams. Soccer, rugby union and lacrosse are also played professionally in Alberta. Tourism is also important to Albertans. A million visitors come to Alberta each year just for Calgary's world-famous Stampede and for Edmonton's Klondike Days. Edmonton was the gateway to the only all-Canadian route to the Yukon gold fields, and the only route which did not require gold-seekers to travel the exhausting and dangerous Chilkoot Pass. Visitors throng to Calgary for ten days every July for a taste of "Stampede Fever". As a celebration of Canada's own Wild West and the cattle ranching industry, the Stampede welcomes around 1.2 million people each year. Only an hour's drive from the Rocky Mountains, Calgary also makes a visit to tourist attractions like Banff National Park something which can easily be done in a day. Calgary and Banff each host nearly 5 million tourists yearly. Alberta is an important destination for tourists who love to ski and hike; Alberta boasts several world-class ski resorts. Hunters and fishermen from around the world are able to take home impressive trophies and tall tales from their experiences in Alberta's wilderness. Alberta has enjoyed a relatively high rate of growth in recent years, due in large part to its burgeoning economy. Between 2003 and 2004, the province saw high birthrates (on par with some larger provinces such as British Columbia), relatively high immigration, and a high rate of interprovincial migration when compared to other provinces. As of 2004, the population of the province was 3,183,312 (Albertans). 81% of this population lives in urban areas and 19% is rural. The Calgary-Edmonton Corridor is the most urbanized area in the province and one of the densest in Canada. Many of Alberta's cities and towns have also experienced very high rates of growth in recent history. Racially and ethnically, the province is predominately Caucasian. 88.8% of the population is either white or Aboriginal (Aboriginals represent a fairly small proportion of this percentage, however). This number is significantly smaller in many of the cities, particularly Calgary and Edmonton which are home to a much larger number of visible minorities. Most Albertans identify as Christians. Nevertheless, many people in the province observe other faiths or do not profess to a religion at all. Alberta has a somewhat higher percentage of evangelical Christians than do other provinces. The Mormons of Alberta reside primarily in the extreme south of the province. There are temples in both Cardston and Edmonton. Many Alberta Mormons descend from Mormon pioneers who emigrated from Utah around the turn of the 20th century. 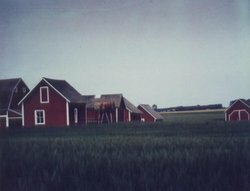 Alberta also has a large Hutterite population, a communal Anabaptist sect similar to the Mennonites, and a significant population of Seventh-day Adventists in and around the Lacombe area due to the presence of the Canadian University College. Many people of the Hindu, Sikh, and Muslim faiths also make Alberta their home; one of the largest Sikh temples in Canada is located just outside of Edmonton. The present province of Alberta as far north as about 53° north latitude was a part of Rupert's Land from the time of the incorporation of the Hudson's Bay Company (1670). After the arrival in the North-West of the French around 1731 they settled the prairies of the west, establishing communities such as Lac La Biche and Bonnyville. Fort La Jonquière was established near what is now Calgary in (1752). The North-West Company of Montreal occupied the northern part of Alberta territory before the Hudson's Bay Company arrived from Hudson Bay to take possession of it. The first explorer of the Athabasca region was Peter Pond, who, on behalf of the North-West Company of Montreal, built Fort Athabasca on Lac La Biche in 1778. Roderick Mackenzie built Fort Chipewyan on Lake Athabasca ten years later in 1788. His cousin, Sir Alexander Mackenzie followed the North Saskatchewan River to its northernmost point near Edmonton, then setting northward on foot, trekked to the Athabasca River, which he followed to Lake Athabasca. It was there he discovered the mighty outflow river which bears his name -- the Mackenzie River -- which he followed to its outlet in the Arctic Ocean. Returning to Lake Athabasca, he followed the Peace River upstream, eventually reaching the Pacific Ocean, and so being the first white man to cross the North American continent north of Mexico. The district of Alberta was created as part of the North-West Territories in 1882. As settlement increased, local representatives to the North-West Legislative Assembly were added. After a long campaign for autonomy, in 1905 the district of Alberta was enlarged and given provincial status. The three climatic regions (alpine, forest, and prairie) of Alberta are home to many different species of animals. The south and central prairie was the land of the bison, its grasses providing a great pasture and breeding ground for millions of buffalo. They were virtually destroyed by early white settlers, partly for sport, partly for the warm buffalo fur, which was used to make coats, and partly as one means of destroying the culture of the native people. The white settlers felt that the best way to "civilize" the natives was to make sure that they thought and behaved like the white men, and by removing the buffalo, a critical element of native culture, thought they could do so. Since then, buffalo have made a strong comeback, and thrive on farms and in parks all over Alberta, and the native culture is also growing stronger again. Alberta is home to many large carnivores. Among them are the grizzly and black bears, which are found in the mountains and wooded regions. Smaller carnivores of the dog and cat families include coyotes, wolves, fox, lynx, bobcat and mountain lion (cougar). Herbivorous, or plant-eating animals, are found throughout the province. Moose and deer (both mule and white-tail varieties) are found in the wooded regions, and pronghorn antelope can be found in the prairies of southern Alberta. Bighorn sheep and mountain goats live in the Rocky Mountains. Rabbits, porcupines, skunks, squirrels, and many species of rodents and reptiles live in every corner of the province. Alberta is fortunate in that it is home to only one variety of venomous snake, the prairie rattlesnake. Central and northern Alberta and the region farther north is the nesting-ground of the migratory birds. Vast numbers of ducks, geese, swans, and pelicans arrive in Alberta every spring and nest on or near one of the hundreds of small lakes that dot northern Alberta. Eagles, hawks, owls, and crows are plentiful, and a huge variety of smaller seed and insect-eating birds can be found. Alberta, like other temperate regions, is home to mosquitoes, flies, wasps, and bees. Rivers and lakes are well stocked with pike, walleye, white fish, rainbow, speckled, and brown trout, and even sturgeon. Turtles are found in some water bodies in the southern part of the province. Frogs and salamanders are a few of the amphibians that make their homes in Alberta. In central and northern Alberta the arrival of spring brings the prairie anemone, the avens, crocuses, and other early flowers. The advancing summer introduces many flowers of the sunflower family, until in August the plains are one blaze of yellow and purple. The southern part of Alberta is covered by a short grass, very nutritive, but dries up as summer lengthens, to be replaced by hardy perennials such as the buffalo bean, fleabane, and sage. Both yellow and purple clover fill the roadways and the ditches with their beauty and aromatic scents. The trees in the parkland region of the province grow in clumps and belts on the hillsides. These are largely deciduous, typically birch, poplar, and tamarack. Many species of willow and other shrubs grow in virtually any terrain. On the north side of the North Saskatchewan River evergreen forests prevail for hundreds of thousands of square kilometres. Aspen poplar, balsam poplar (or cottonwood), and paper birch are the primary large deciduous species. Conifers include Jack pine, Rocky Mountain pine, Lodgepole pine, both white and black spruce, and the needle-shedding tamarack.